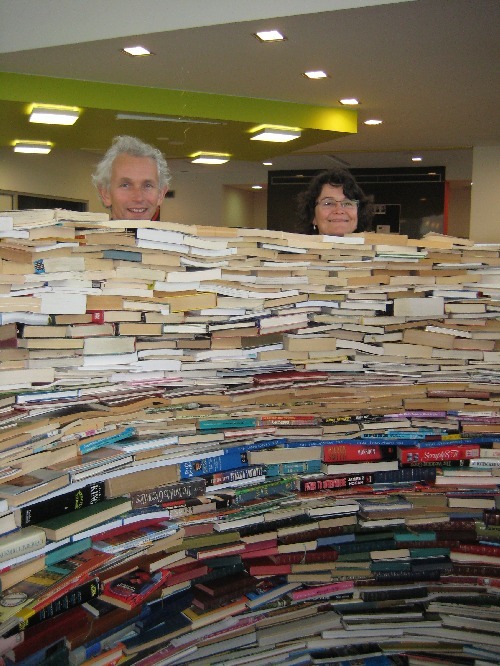 Brain Sell (2005) Installation of 5000 books at Falcon eLibrary. Click image for story. Much of our life, be it school, work and recreational time is spent reading, writing on, printing on and shuffling paper. Last night I finally completed my annual tax return. I fondly remember when it was just four pages and I only did it once a year. Now it is 16 pages to complete and comes with 268 pages of instructions in 3 books. The forthcoming election has already created a flood of paper urging us to "buy" a particular party product for the next three years. Even artists, despite the public's misconceptions, spend time "doing the paperwork". As the coordinator of an artist's studio I have daily doses of paperwork to complete. Similarly, for a public art commission I face multiple drafts of contracts, promotional flyers, concept drawings and architectural plans. Then there is the paper generated by our day-to-day living. The daily mail and house bills to be read and responded to. In order to be informed and prepared for the changing world around us we need THE NEWS. The daily paper. And/or the TV Guide. The free local weekly paper. Similarly the paperless office has become a paper cocoon! Our walls are lined with bookshelves of books. Our desks overflow with paper. Our fridges are littered with notes, calendars, phone numbers, photos, school awards and invitations. Half my weekly rubbish is paper. My local council recycles 1,500 tonnes of paper from 15,000 households and businesses. The Town of Vincent is a small local government. Is that 10 kgs per house or business? On a more personal level: emotional paper. The private life of paper: Individual pieces of paper hide from us and cut our fingers. Paper as a messenger brings joy, and pain, to our lives. These are perhaps the pieces of paper closest to us. From loved ones, wishing us a happy birthday, marriage, anniversary, as well as comfort during time of stress or sorrow. Paper records our achievements. The school award, report card, certificate and thank you note. The birth and marriage certificate. Consider paper and its' value: Despite e-commerce, our financial system still depends upon paper. There is still the need for the receipt. The bill. To be kept for the tax office for 5 years, just in case. Historically; paper notes and bank bills replaced gold as a medium of exchange. It is lighter, more transportable and convenient. But it is also not permeant. Blank cheques have no value; signed cheques can be worth millions. Cashed, they become worthless. Similarly the value of bonds goes up and down, in the opposite direction to interests rates. Even the value of non-financial paper changes: The older the piece of paper, the more valuable it becomes. Old newspapers suddenly become important. Old and rare books become valuable, often regardless of their content. There is also the paradox of the paper used: The most fragile of paper is used for religious books, such as the bible. Yet government records must be kept on archival quality paper, which lasts almost indefinitely. Just in case, in hindsight someone did something wrong, or important. With the advent of the computer printer and the Internet, suddenly there is an unlimited amount of information that can be printed out onto paper. To be read once, and then discarded. A Queensland Reporter, Jeremy Newton-John stated, that a "ton of information is worth a kilogram of knowledge, which is equal to a gram of wisdom". You see before you three works of mine made out of paper. Based upon Jeremy's ratios, then their combined weight of roughly 30 kilograms means that they probably contain only fractions of a kilogram of knowledge and probably no wisdom. Based upon Jeremy's ratio then religious books probably contain even less wisdom. But before you over-react consider this, despite the existence of these and other "rulebooks" for living, we still have wars and terrorism, even today. It is not the existence of information, knowledge and wisdom that makes ours a better world, it is how we use them. Let me repeat: It is not the existence of information, knowledge and wisdom that makes ours a better world; it is how we use them. Rote learning never made a better world. It is applied information, it is applied knowledge, and it is when we apply our wisdom, that makes ourselves and our world better. The Wisdom of Solomon meant nothing, until he used it. Around you are the many works by the students. I would like you to reflect upon the processes involved in creating these original works. Already, during their short lives the students have been exposed to literally tonnes of pages of information, kilograms of knowledge and hopefully, grains of wisdom. But exposure to something does not necessarily mean that something is absorbed and learnt. You can swim in the ocean, but you don't necessarily drink it. It is only when we actively interact with the world around us that we actually learn, or absorb part of the world. Art making is inherently an active or reactive process. The materials are difficult to control, and a pleasing result is usually the result of lots of false starts, mistakes and repair jobs. It involves the head, the hand, and the heart. Making art, brings us out of ourselves. It reflects our concerns, our experiences. It shows ourselves. The artwork around you reflects the aspirations, concerns and ways in which the students see themselves, those around them and their world. Art shows how they see. So parents, like good listening, it takes time to look. It takes time to look carefully at their work, and to see their world, through their eyes. And their friends eyes. A good school encourages active learning by its students. A good school encourages active involvement of parents and the community in the learning process. This exhibition provides an opportunity for everyone to see with fresh eyes, with younger eyes. I hope you gain some useful information, some insight, and perhaps even a little wisdom. I am delighted to officially open this exhibition.